It happened so fast I was unprepared. I was sitting outside the Ramenshop and Koniki was tending shop. We had a single solitary customer and things were quiet. I was writing into my journal. Then suddenly a rough looking man appeared. He slammed his fist on the counter and demanded a tray of food and some sake. Gentle little Koniki said, “of course, sir” and then served him. I sat in the public area, while Koniki tended to our guest. Then the man in dark clothing appeared with kantana attached to his side. This was a man I’d never seen before, but his appearance was similar to the description others had given me of him when they talked of yakuza. Both Koniki and I tried to remain calm but I was very frightened, and I know my gentle little cousin was too. I didn’t know if he would take more of our food or take some of the shops furnishings. I remembered my husband’s teachings and I gave the outer look of cold calculation. 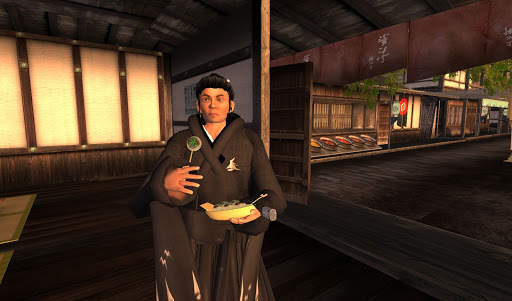 Then as he walked out of the store, stuffing his face with the stolen food, samurai began to enter the market area from different directions. The man saw this before I did and he quickly returned and paid Koniki, saying “I’m sorry for the misunderstanding. Let me pay you.” Before long four samurai had entered the area around the Ramenshop and my sense of relief was palpable. The yakuza man stood eating his food, smiling and making jokes with the samurai. I told the samurai I was very happy they were there. I hadn’t called the samurai but I learned later that evening from empress Ami sama that samurai would patrol the market area for yakuza. 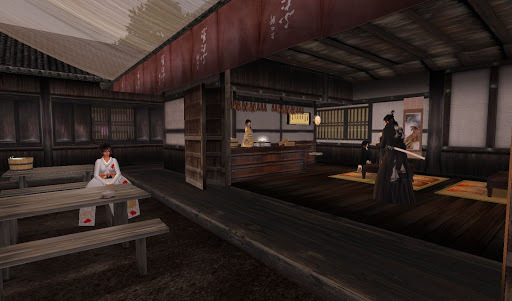 Ami, Taka and I spent time that evening discussing some changes that Ami had made recently in the area. It was pleasant evening and I didn’t know quite how to tell my husband of the events of the day. Ami sama, Takamatsu sama and I stood outside the newly engineered gate to Hosoi Ichiba. It is a formidable structure and truly fitting for such a great marketplace. Later in the evening I finally told Taka of the yakuza. His response was immediate. Taka said it is time for me to learn the use of the kantana. And although I’ve received martial arts training from Taka sama in recent months, I was terrified by the mighty kantana. None the less, Taka said this was going to be a time of turmoil in our new land and I must be prepared to take my training to the next level. 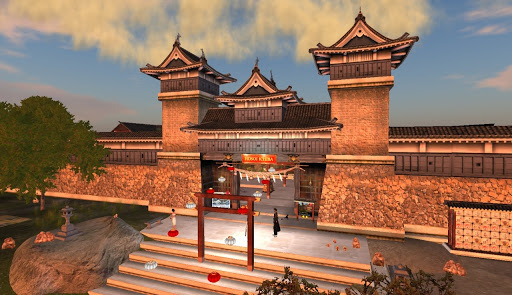 This entry was posted in Writing and tagged Adventure, Geisha & Samurai, Photography, Role Play, Second Life, Stories, Writing. Bookmark the permalink.